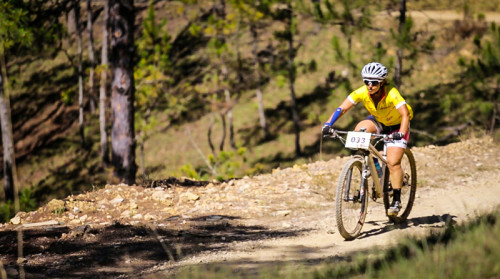 On Friday March 20th racers from around Vietnam and more than 7 other countries hit the starting line in Da Lat for the first-ever international open mountain bike stage race in Vietnam, The Vietnam Victory Challenge. Vietnamese teams were anxious and excited, sprinting aggressively from the starting line of stage one. The race was full throttle even though the riders knew that less than 1 kilometer down the road they faced a hard right and the first of many brutally steep climbs. This one only 900 meters long, but with pitches as steep as 17% it immediately set the tone for the rest of the day. This was to be the hardest of the 3 days and of 103 registered riders only 67 finished the first day within the time cut. The logistical hurdles and governmental ‘hiccups’ were now an afterthought as I raced on my motorcycle to take a shortcut to get ahead of the racers. It had taken months of back and forth negotiations with government officials and the Vietnamese Cycling Federation to receive the necessary approvals. We were required to modify the selected courses that were already painstakingly scouted out no less than 4 times in the lead up to the race; as the local officials were afraid the course would be too difficult for Vietnamese riders new to mountain biking. Government permit costs more than doubled as the start of the race neared as officials realized we were locked in with no choice but to pay. Prizes and water bottles for the race that were generously sponsored by Specialized Bicycles were held hostage until just one day prior to the official start as customs officials tried to see if we would break down and offer the typical bribe money to release them (we didn’t). However, I was now focused on making sure everyone had a great race and made it to the finish line safely each day. Sarah Kaufmann of Stan's No Tubes on her way to the overall win. 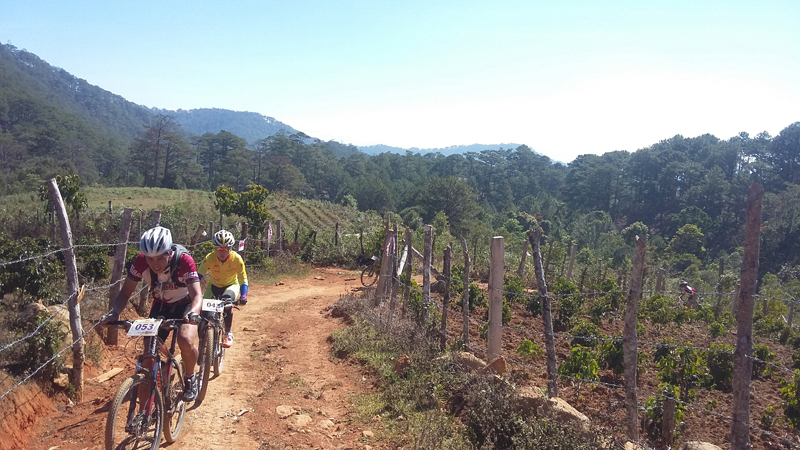 The first day of riding took racers through dirt paths used by local farmers that wound through fields, neighborhoods and the steep pine-lined trails surrounding Lang Bian Mountain. After traversing amazing single track riders found themselves back in a narrow valley lined with coffee fields on the sides of the mountains and even more climbing before they headed back towards the city of Da Lat for a fast downhill finish into the Valley of Love park on the edge of the city. In the pro men’s field the two-time Canadian marathon mtb national champion, Cory Wallace riding for Kona, took a convincing win by finishing 13:46 ahead of second place, Bastian Dohling from the Specialized Mavericks Team out of Singapore. Sarah Kaufman, from Utah riding for Stan’s No Tubes, finished soon after to take stage one in the pro women’s field by 15:19 over local rider Dang Thi Ngoc Huyen. The rest of the competitive riders rolled in throughout the morning and early afternoon. Stage two took the reverse of stage one. As day one proved to be much more difficult than many expected there were a few riders that lacked the courage to start the day but who later regretted that decision after trail reports from the first finishers of the day. As promised, riding the course in the opposite direction proved to be a completely unique experience compared to stage one. Although still difficult, riders felt the course offered more downhill this direction and added a lot more fun, minus just a little bit of pain. Wallace once again won the pro men’s field by 21:58 over second place rider Dohling. The race for third was an exciting sprint between David Lloyd of the Hanoi Cyclists team and Phung Van Loc of the Vietnamese QK7 military team. Lloyd was in the lead as he approached the line but was edged out and pushed to third when Loc caught him a few meters before the finish line. Pro woman, Kaufman, finished in first once again but only after riding the last 3 kilometers on a flat tire through one of the rockier sections of the day. The final stage was a 10.5 kilometer loop surrounding the Valley of Love park area. The course started in the heart of the park with a moderate rolling climb through fire roads lined with pine trees before taking a fast descent past some local farms. After one more short, steep climb the course rolled downhill through sections of hard-packed single track and more fire roads before briefly touching paved road to enter the front of the park again. Despite the severity of two of the short climbs, pro men were able to put lap times in as low as 27:00 with Kaufman right behind them at 33:00-35:00 laps. Having the last day on a short lap course added another level of fun and competition to the race as riders could now more easily judge their efforts and track their competition throughout the day. Unfortunately Lloyd, 3rd in the men’s pro overall, pushed himself quite literally to breaking point on a rolling descent resulting in a broken collarbone. Loc from the QK7 team was then able to take the last step on the podium. The men’s 39 and under category also saw a hard fought battle each day with riders changing places on the podium almost daily, but Matthew Wright from the UK gained enough time the last day to get the overall victory. Morten Hansen, resident of Singapore, dominated the men’s 40 and over category on his S-Works Epic which proved to be the perfect bike for the three stages. The amateur women’s field was the only one boasting a Vietnamese winner, but there were really two. Vo Thi Bich Lam and teammate Truong Thi Bich Nhien were only separated by .02 seconds in the overall standings. Perhaps the most inspiring finish of the day was Neil Savage of the UK. He was the only rider in the fun-ride category to compete and finish each grueling stage. Riders reported time and again that they were impressed with the race organization, speed of results and with the performances of the local riders. Many riders expressed their disappointment that they wouldn’t be racing again the next day. This race is sure to become a classic in Southeast Asia as participants are already begging for details about the 2016 edition of the race. Final race results are posted at vietnamvictorychallenge.com.